Travelling overseas is terrific— but the stress of navigating your way through the airport can put a major downer on the start of your vacation. With that in mind, here are some tips and tricks that will help you sail through ORD Airport with ease. Apps make the ultimate travel companions, so make sure your smartphone or tablet is packed full of them. AndMyTSA is particularly useful as it answers the most common airport-related questions — for example, use it to find out how busy ORD is likely to be on the day of your flight or how long the queues are at security. You can find out more about this terrific travel app on the TSA website. Apparently, since most people are right-handed, they’re most likely to turn right at the security checkpoint, leaving fewer people in the left-hand queue. Why not put this theory to the test? – you’ve nothing to lose and might gain more pre-flight relaxation time. There are lots of great amenities for travellers to use at ORD, so have fun and go explore. To relax your body and mind for the flight ahead, check out the yoga at Terminal 3 or alternatively, chill in the aeroponic garden and tuck into some of the tasty veg grown there. For more information on ORD facilities, check out the official website. Airport security rules require you to put any liquids in your hand luggage into clear plastic bags and it’s a good idea to bring spares in case of mishaps. But better yet, pack your fluids into plastic bags at home so that you’ve one less thing to worry about at security. Save yourself some serious dollars by booking your airport parking in advance. Sites such as Looking4.com offer early-bird deals on parking at O’Hare Airport – with plenty of valet and park and ride options available. If you’ve opted for the bog-standard black suitcase that most vacationers have – personalize it. Try tying a bright coloured ribbon around the handle so that your luggage stands out at baggage collection. Avoid extortionate food costs at the airports by bringing your own snacks. And whether they’rechips, candies or cereal bars, pack plenty. Pre-packed snacks help you avoid unnecessary expense and a rumbling stomach. The airport and plane are often cold, so bring a scarf or light jumper with you to avoid catching a chill. And if it’s too warm for a scarf or jumper, you can always use them as a pillow or back support for added comfort on your flight. 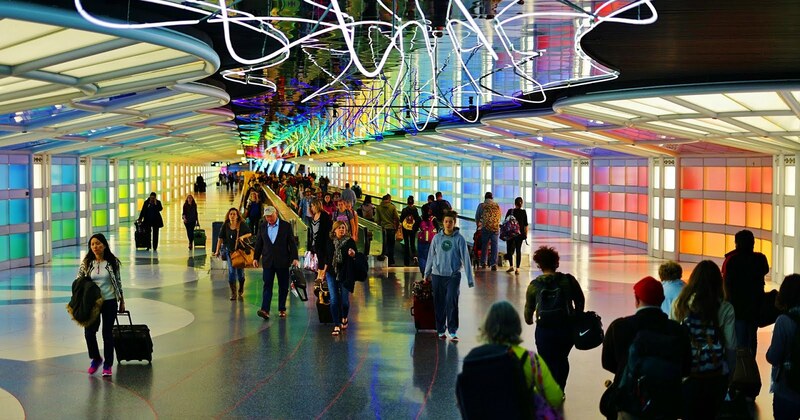 With these eight super hacks at hand, your next visit to ORD will be a breeze. What are your favourite airport hacks?